Nicholas Borelli II (Noah Munck), a sheltered suburban teen, has the adventure of a lifetime when his plans for math camp take a sudden turn. Instead, he is forced to spend his summer in Brooklyn, New York, with the family he never knew he had—his Italian grandmother Tutti (Rita Moreno) and Uncle Frankie (Steven R. Schirripa). A fish out of water, Nicholas leans on the local kids to help him fit in and ends up with a slick new persona: Nicky Deuce. But when Nicky runs into trouble, he discovers a family secret and learns that the tough streets of Brooklyn aren’t always what they seem. 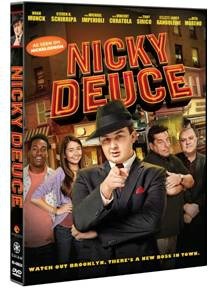 Starring Noah Munck (Gibby from “iCarly”), Cristine Prosperi (Imogen from “Degrassi”), Steve Schirripa (from “The Sopranos” and “The Secret Life of the American Teenager”), and Cassius Crieghtney, with Vincent Curatola, Tony Sirico and Michael Imperioli from “The Sopranos,” Rita Moreno, and a special appearance by James Gandolfini (from “The Sopranos”). Please enter by using the Rafflecopter a Rafflecopter giveaway Disclaimer: No monetary compensation was received. my nephew is obsessed with this show. Another great movie for the whole family to watch together. Would love for the family to have this!!! Thanks!!! My daughters would enjoy this!